Bless the inventor of the terrace – that space of dreams that connects with the house and allows us a sunny sit-down (or in the shade) to catch some fresh air and get lost in our daydreams (or a good book, or some jovial jams… ). And since we on homify are all about architecture and design, we thought we’d dedicate today’s homify 360° discovery to a sunny little terrace that can make all of the above (and more) come true. Draped in white and framed by bright greens and sky blues, the terrace is the perfect link between the exterior freshness and interior comfort. And although one can only imagine what additional furniture and décor would look like (some comfy chairs, a coffee table, perhaps a potted plant or two… ), it looks quite magical and stylish leaving it clean and open as is. Whether it’s an architect, floor planner, or garden expert you’re after, check out our range of professionals here on homify. 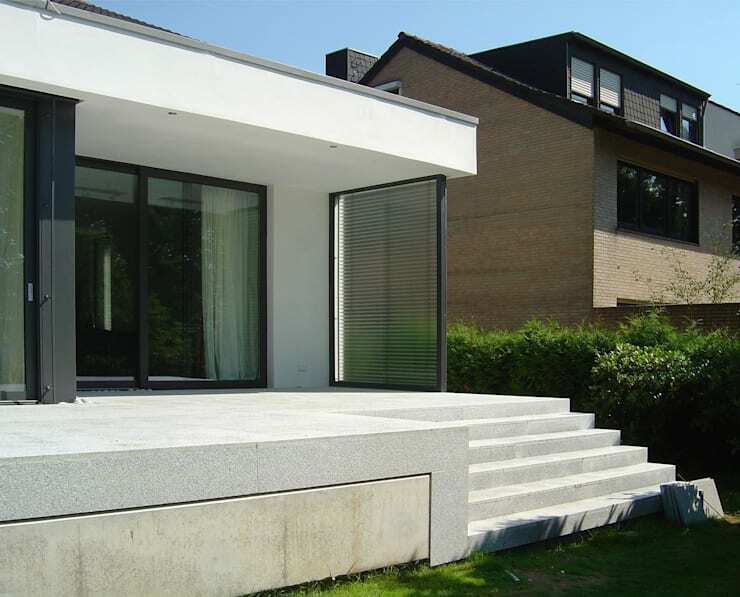 Light-grey concrete adorns both the terrace and steps, ensuring a consistent look. 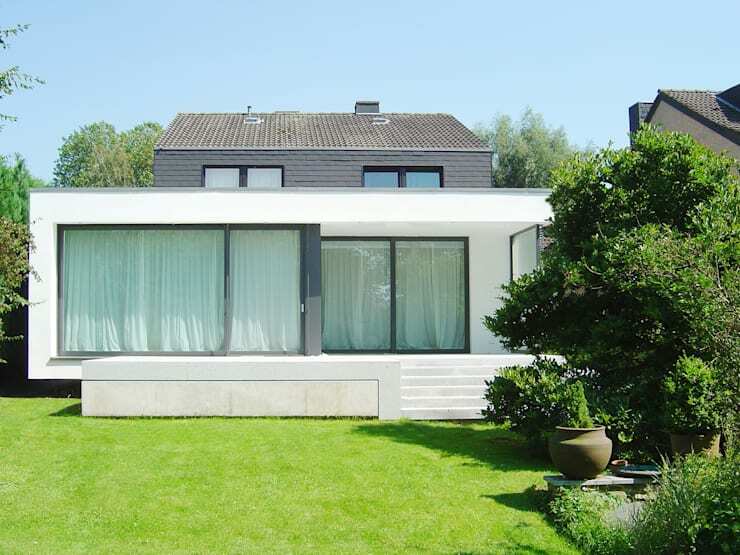 And although glass balustrades would have added to the modern effect, we prefer the terrace to stay wide and open as is, freeing the house from what could have been a closed-in look. To offset with the pale tones (yet continue the neutral palette), jet-black railings frame the windows and glass sliding doors of the house, announcing the start of the interior spaces. We quickly sneak indoors to admire the terrace from the interior side of the house, and also to see the garden view that one gets to enjoy from the terrace’s view. A myriad of fresh trees and plants – is that not just the most perfect view to have when relaxing in the sun in one’s own back yard? 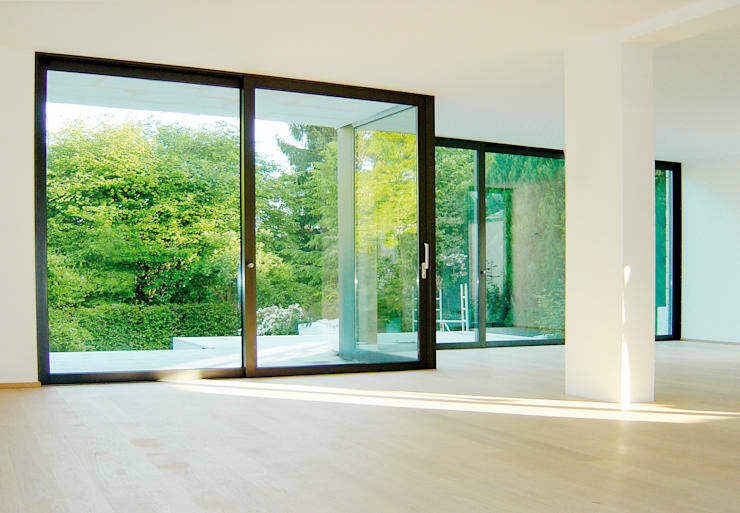 In addition to lush greenness, an abundance of natural light streams indoors thanks to those superb glass sliding doors. 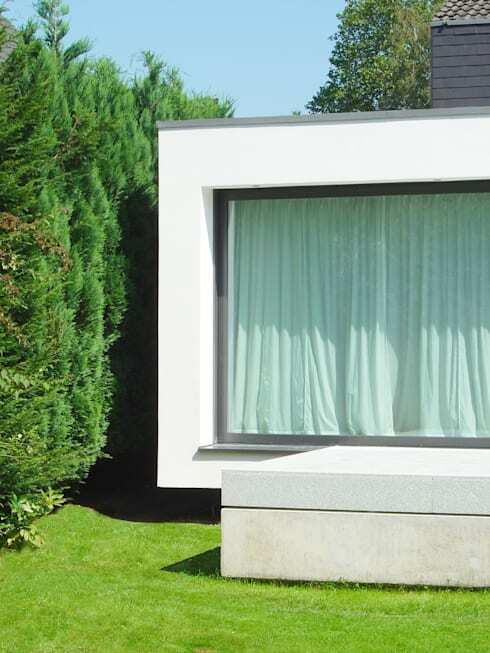 Looking closely at the spot where the terrace meets the house, we can see a curious floating effect taking place, with the main house having a sort of cantilevered look while attached to the ground-bound terrace. Does this space inspire you to enjoy some “me” time on your very own terrace, or make you dream about having one? Be sure to take a look at these 10 Terraces To Boost Your Home’s Style for some more inspiration.